Do you have both the Regular Gold also? Could you PLEASE post a scan of both the regular gold foil and the mirror gold. Would really appreciate it. How much are you looking for the two Sandlot SportsFest Cards /10? Just thought if you would be interested in some Ripken’s I have, I am also retired Navy. I am a Jeter supercollector in Virginia. Hello, I'm a Puckett collector and I'm searching for a 1996 Topps Mystery Ripken with the black unpeeled film. I'd love to find a refractor and regular issue with the film if possible. I'd like to get them for the Puckett's pictures on back. I'm also looking for an unpeeled refractor of Gwynn and a regular unpeeled Puckett to complete the run. Any luck you have anything due to Ripken being included on all wanted cards? 08:29 PM - LWMM mentioned Calripkenjrcollector in post Who has the largest player collection (most different cards) on this board? 06:24 PM - viper mentioned Calripkenjrcollector in post 1999 Fleer Tradition Date With Destiny (Not Die Cut or Serial Numbered)? 03:20 PM - Calripkenjrcollector mentioned SINFULONE in post Post your unique serial numbered cards here! 12:55 AM - Gwynn545 mentioned Calripkenjrcollector in post Official FCB PLAYER COLLECTORS List--Collectors Welcome! 12:08 AM - Calripkenjrcollector quoted BunchOBull in post Post your unique serial numbered cards here! 02:21 AM - banjar quoted Calripkenjrcollector in post Post your unique serial numbered cards here! 06:04 PM - Calripkenjrcollector quoted jacksoncoupage in post What are some of the forgotten sets that some of us are working on..
02:16 PM - jacksoncoupage quoted Calripkenjrcollector in post What are some of the forgotten sets that some of us are working on..
04:03 PM - death2redemptions quoted Calripkenjrcollector in post Anyone had this problem on Ebay? 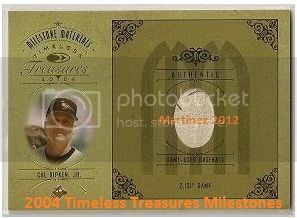 04:01 PM - Calripkenjrcollector quoted death2redemptions in post Anyone had this problem on Ebay?